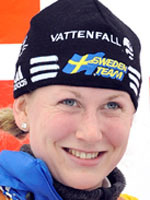 Sweden's Helena Jonsson has exploded onto the women's biathlon scene, striking terror into rivals hearts with a stunning set of results in the 2008-09 world cup that saw her squeeze past the favourites for the overall crystal globe. Before this her record was nondescript: 17th in 2007 and 42nd in 2006. So the current run of form that also includes the 2009 world championship pursuit title has left some rivals open-mouthed and gasping for breath. Jonsson's 2009 World Cup title was a real surprise and indeed she only won after coming second on the last race on the calendar, the mass-start at Khanty-Mansiysk, where favourite Kati Wilhelm the triple Olympic champion cracked. For Jonsson to win the title she needed Wilhelm to finish fifth and in the end the gutsy red-headed soldier could only manage sixth. Wilhelm and Jonsson both had the same number of points but the Swede was crowned queen of the biathlon thanks to a higher number of actual wins, four to Wilhelm's three. Coached by Germany's Wolfgang Pichler, who has led the Swedish team since 1995, Jonsson thereby ended a series of three straight world cup wins by German athletes: Magdalena Neuner (2008), Andrea Henkel (2007) and Kati Wilhelm (2006). Jonsson, born in Helgum September 6, 1984, also won the sprint and the mass start in 2009, making the pre-Olympic season a particularly bountiful one. Her wonderful results at the very top level make her one of the favourites for the Vancouver Games, especially with Ekaterina Iourieva having been suspended after a positive test for the blood booster EPO. The Russian had been dominating the world cup up until that point. Slowly but surely then Jonsson has been climbing to the highest stature and is starting to resemble her compatriot Magdalena Forsberg, who dominated the discipline between 1997-2002, also under the guiding hand of Pichler. The start of the Olympic season has only served to confirm Jonsson's promise with three wins in the first five races. Her first world cup win came at the mass-start at Khanty-Mansiysk in March 2007 and she has swiftly become the top dog in this gritty event. Her rivals though, including Wilhelm, her Swedish team mate Olofsson-Zidek and the Russians Svetlana Sleptsova and Olga Zaitseva, will also be gunning for gold once the first shots are fired out in Canada.